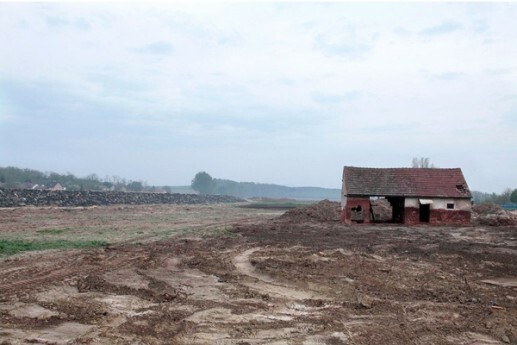 Tomorrow exactly one year ago, on Monday October 4th 2010, near the small town of Devecser in Hungary a large reservoir of aluminum bauxite waste collapsed and approximately one million cubic meters of toxic waste poured out polluting the town and many kilometres of nature and agricultural land. Most of it ended up in a small river delivering the toxic waste to the Danube. The pollution was 70 times as bad as the Erika disaster (the greatest pollution scandal in France). Almost one million cubic meters of Toxic red mud swept all aquatic life and killed at least nine people and wounding more than 120, many with chemical burns. The flood of 12 meters high passed several towns, sweeping away cars and houses and drenching the soil. Six months later in May 2011 our French friend and colleague photographer Pieter-Jan Louis visited the site. He encountered a virtual ghost town. The pollution was less concentrated but extended by the dust cover. In the small rural villages police was posted every kilometer denying access to the most sensitive areas. Pieter-Jan had to hide several times in order to be able to take the photos for his report. The reception of the people and local associations was itself cold. Nobody wanted to talk to him. Farmers cultivated the land, still red. 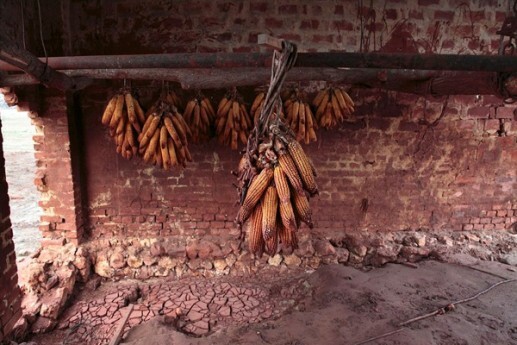 Fresh red corn hung drying in the ruins. The economy seemed to be picking up even though the red pollution was still ever present. Go to his images here (English) or To Babel Blog (French).